"You know the rules, people. Someone drops the ball, we get the call." With 1997's Event Horizon, Anderson moves himself into the fairly legit realm of sci-fi/horror with a dark, brooding story set in deep space that supplies a futuristic merging of the haunted house and outer space genres into a sleek, spooky package. Vocal Anderson detractors have always unceremoniously mocked Event Horizon as overstylized and pointless fluff, but there has also been a very loyal fanbase for this particular film, and this new two-disc set (with an anamorphic transfer and a DTS track) is no doubt welcome. There's a lot of pseudo-hard science mumbo jumbo in the dialogue, but it's mostly filler in between the creepy on this horror-in-space film, as the deep space rescue vessel Lewis & Clark is sent on a mission to the dark side of Neptune to search for the enigmatic ship, the Event Horizon, which mysteriously disappeared years before. 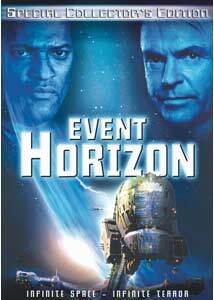 The Lewis & Clark's head honcho is the gruff Captain Miller (Laurence Fishburne), who has reluctantly brought along Dr. William Weir (Sam Neill), the man who designed the Event Horizon and is knowledgeable on things like dimensional gateways and gravity drives. It seems Weir's ship has the capability to travel between dimensions or bend gravity or something like that, which is all inconsequential because the short version is that wherever the Event Horizon was during its missing seven years, it has come back as something very, very evil. I've always been in the "like it" camp for Event Horizon, and it is easily the often maligned Anderson's strongest work. And in this era of overblown, three-hour "epics," this one moves fast, with a runtime just over 90 minutes, and that is probably one of the film's hidden strengths. It's a lean story to be sure (crew finds haunted spaceship), so the buildup and payoff are presented efficiently and with little excess fat. Image Transfer Review: The big improvement here over the previous release is that the 2.35:1 widescreen transfer has been given the anamorphic treatment. The print itself is in excellent condition, with just a few evident bits of debris, but it sports the same high degree of image detail and color rendering found on the nonanamorphic version. Black levels are rock solid, making all those dark and shadowy sequences easy to follow. No evidence of compression issues or artifacting to be found. Audio Transfer Review: The back cover makes no mention of it, but there is an English-language DTS track on this release, and as expected it's a properly deep and boomy presentation, on par with the Dolby Digital 5.1 surround track that is also included. Crisp, clear voice quality, plenty of precise directional movement, and the rear channels are active often, enhancing the creepy surroundings of the film. In terms of sound mixing, both the DTS and 5.1 are exceptionally well done. A far less immersive 2.0 English language surround track is also provided, as is a 2.0 French dub. Extras Review: Disc 1 carries the feature, which is cut into 17 chapters with optional subs in English or Spanish, as well as trailers for Aeon Flux, MacGyver: The Complete Fourth Season, The Warriors and Get Rich or Die Tryin'. There's also a new commentary track from director Anderson and producer Jeremy Bolt, with the two Brits chatting amicably in nearly identical voices about the usual casting, script and production issues, including acknowledging the criticisms of some of the dialogue that they claim was supposed get a laugh. The mood is fairly upbeat for such a dark film, though at times bordering on being little bit too full of reverential self-praise. Disc 2 is where the rest of the supplements are held, led by the five-part doc, The Making of Event Horizon (01h:42m:55s), which oddly enough runs longer than the feature itself. Divvied in separate sections, each detailing a particular aspect of the production, the segments are the origins and initial development issues with Into the Jaws of Darkness (14m:57s), the design of the spacecraft in The Body of the Beast (22m:48s), "the Hell stuff" in Liberate Tutume Ex Infernis (19m:54s), the specials effects are covered in The Scale to Hell (18m:41s), and The Womb of Fear (26m:35s) looks at the hectic post-production schedule. A single deleted scene and two extended scenes (10m:03s) are available with optional Paul Anderson commentary, as is The Unseen Event Horizon (02m:57s), which offers director commentary on storyboards of an unfilmed rescue scene and an automated set of conceptual art (06m:53s). The Point of No Return (08m:12s) is quick four-part set of behind-the-scenes footage, also available with Anderson commentary. Things wrap with a pair of trailers, one for the theatrical release, and when for video. As a bonus, the extras on the second disc have subtitle options in English, Spanish or French. A deluxe treatment of this sci-fi film with the cult following has been a long time coming. Finally. This new two-disc set carries a gorgeous anamorphic transfer, a full-bodied DTS track and a whole slew of extras.